Replacement every 100,000 miles or 10 years under normal conditions. Replacement every 75,000 miles or 10 years under adverse conditions. Auxiliary drive belt tensioner tool – Peugeot No.(-).0188-Z. Auxiliary drive belt tensioner locking tool – Peugeot No.(-).0188-Q1. Flywheel timing pin – Peugeot No.(-).0132-QY. Camshaft timing pin – Peugeot No.(-).0132-RZ. Tensioner pulley locking pin – Peugeot No.(-).0153-AL. Timing belt retaining clip – Peugeot No.(-).0153-AE. Remove spark plugs to ease turning engine. 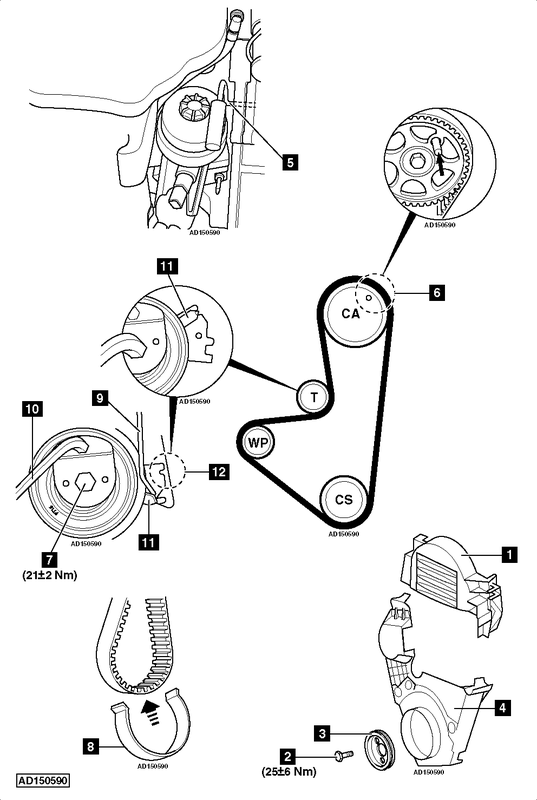 Auxiliary drive belt. Use tool Nos. (-).0188-Z & (-).0188-Q1. NOTE: Mark direction of rotation on belt. Turn crankshaft clockwise to setting position. Insert flywheel timing pin  . Tool No.(-).0132-QY. Insert timing pin in camshaft sprocket  . Tool No.(-).0132-RZ. Slacken tensioner pulley nut to release tension on belt  . NOTE: Timing belt must always be renewed once it has been removed. Check tensioner pulley and guide pulley for smooth operation. Check water pump sprocket for smooth operation. Ensure timing pins located correctly  &  . Fit timing belt to crankshaft sprocket. NOTE: Ensure directional arrows point in direction of rotation. Secure belt to crankshaft sprocket with retaining clip. Tool No.(-).0153-AE  . NOTE: Ensure belt is taut between sprockets on non-tensioned side. Turn tensioner pulley anti-clockwise until locking pin can be inserted  . Tool No.(-).0153-AL. Use Allen key  . Tighten tensioner pulley nut  . Tightening torque: 21±2 Nm. Remove timing pins  &  . Turn crankshaft 10 turns clockwise to setting position. NOTE: DO NOT allow crankshaft to turn anti-clockwise. Insert timing pin in flywheel  . Ensure timing pin can be inserted easily in camshaft sprocket  . If not, repeat installation procedure. Hold tensioner pulley in position. Use Allen key  . Slacken tensioner pulley nut  . Remove tensioner pulley locking pin  . Turn tensioner pulley until pointer and notch aligned  &  . Ensure tensioner pointer and notch aligned  &  . If not, repeat tensioning procedure. Tighten crankshaft pulley bolts  . Tightening torque: 25±6 Nm. Very comprehensive instructions, a simple belt to change. Would be nice if locking pin dimensions were included.! My Peugeot 207 of 2012 model broke it’s timing belt and it’s km reading stands 71000. It’s now two weeks and my Peugeot is still at the Peugeot garage not fixed. Our issue is been send from pillar to post and to all managers and General managers What must we do now?